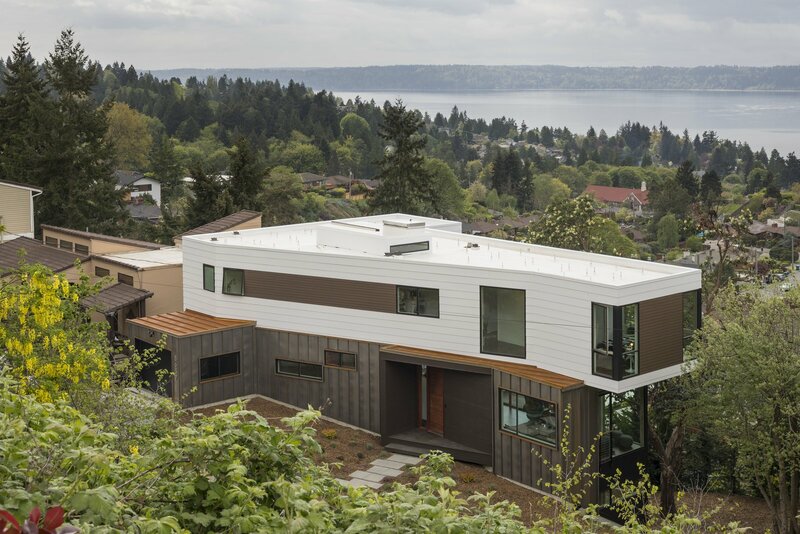 This 3,800sf residence is situated on a west facing hillside of West Seattle capturing the awe inspiring water and mountain views. Descending down a cul-de-sac, the panorama is backdropped by a wooded forest that instantly removes you from the urban environment and transports you into a peaceful oasis. Grade levels out upon arrival, you approach the front of the house through a sculpted wood framed portal greeted by a grand mahogany door. As you enter, unobstructed views through wall to wall glass windows instantly envelop you. 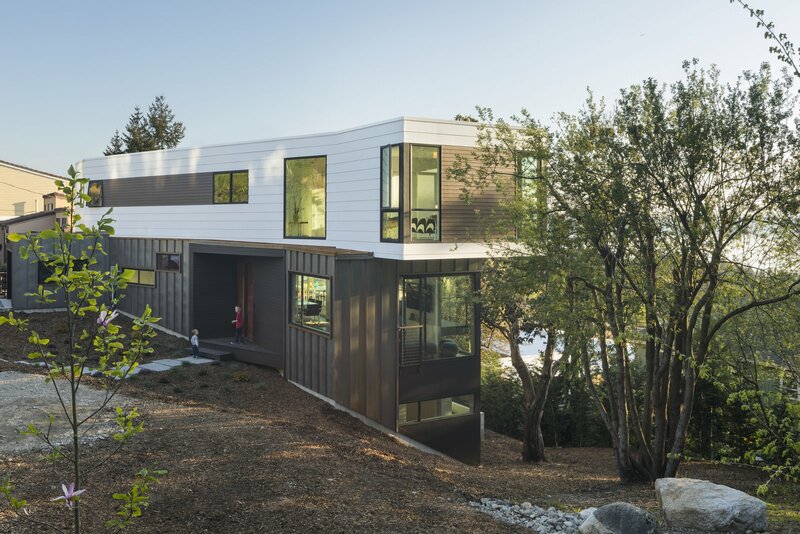 The house is designed around a large, historic and sculptural madrone tree. From every room a new perspective into the landscape is constantly framed by the windows like artwork in a gallery. 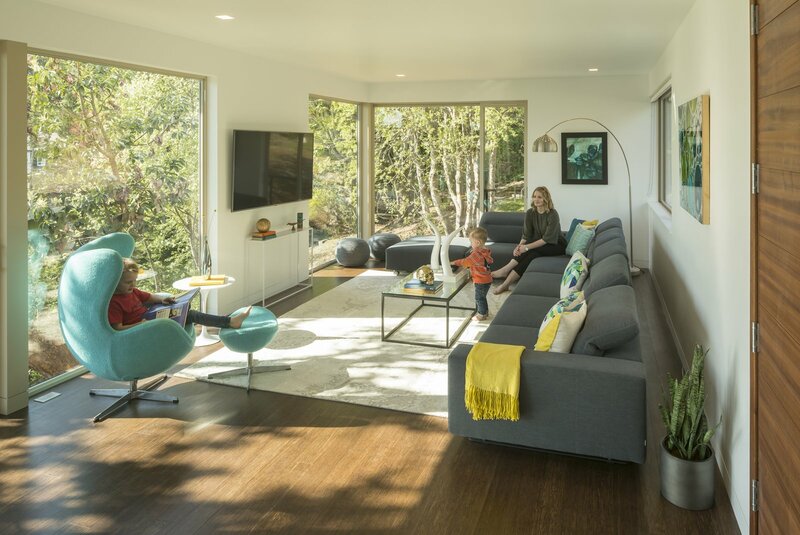 The open plan extends out onto an expansive deck that wraps around the ever-present madrone tree and vistas. The circulation between spaces is fluid, creating graceful dialogues. A modest footprint allowed for minimal site disturbance, preserved all trees and maintained abundant green space undisturbed. A bio-retention garden with cistern was added to harvest rainwater and control storm run-off. Strategically placed fenestration in all rooms frame dynamic western views of mountains, greenery, sea and sky, maximizing daylight and eliminating the use of artificial lighting during the day. A high tech energy efficient building envelope, smart appliances, LED light fixtures and a solar array exceed code requirements. Walking through the house, one continuously realizes spatial experiences created by methodical design decisions. These decisions were defined by the site’s distinctive attributes to form a responsive and dynamic environment, which stimulates the human spirit. The proper balance of architectural elements formed by natural materials allows the house to connect with the landscape while maintaining an intimate habitat. A visionary Architect approached the design for his family with the creative integration of context, function, and natural materials to sculpt this exquisite home. Coupled with passionate Builders who promote environmentally friendly home building methods and craftsmanship, every detail was precisely thought out.